Happy New Year to everyone! The good thing about beer blogging is that when people specially friends noticed that i'm to beers, automatically beer will be my pasalubong to them and i really appreciate it. For risking their luggage carrying a bottled beer from USA to Manila, i really thank you my friend Glenn Kelly Chua. Lagunitas, weeks ago when i posted the beer on instagram and acknowledge Glenn, i got a quick hearts or likes on both my Facebook and IG. That gave me a hint that this beer is quite famous for beer lovers especially to those who have been to the United States. True enough, this beer did not disappoint. This beer despite the bitterness is one of the best beer i have tasted, i am not yet a hophead but beers like of this caliber might instantly steer me to become a hophead. This beer has a medium head with a citrusy aroma. It has golden yellow appearance. It has a smooth,light, lemony first sip and a burst of balanced bitterness comes right after until it reaches your end palate. You can enjoy the aroma while drinking it. Truly an enjoyable beer. Its abv is 6.2%. 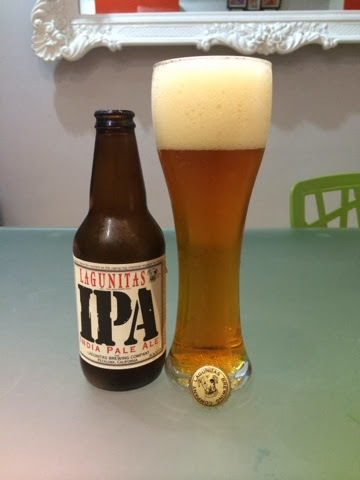 I'not sure if Lagunitas is available in the Metro Manila.Cheers! I'll be posting my top 10 best beer places and top 10 best beers for 2013! Watch out for it. I'm also announcing the winner of the starbucks planner soon!